Zoella Beauty Soak Opera: I have wrote a review on all the Zoella Beauty products I bought which you can find here and I wrote that this was my favourite product from the range and it's still true. Normally I will buy a new shower gel use it once and then go back to Soap and Glory's clean on me but I've yet to go back since using this as I adore the smell of it. I'll admit it doesn't moisturise your skin like 'Clean on me' does but because of the smell I just can't seem to take out my Soap and Glory to use it. This is also a product that you can use as shower gel or you can use it as bubble bath which is pretty cool. 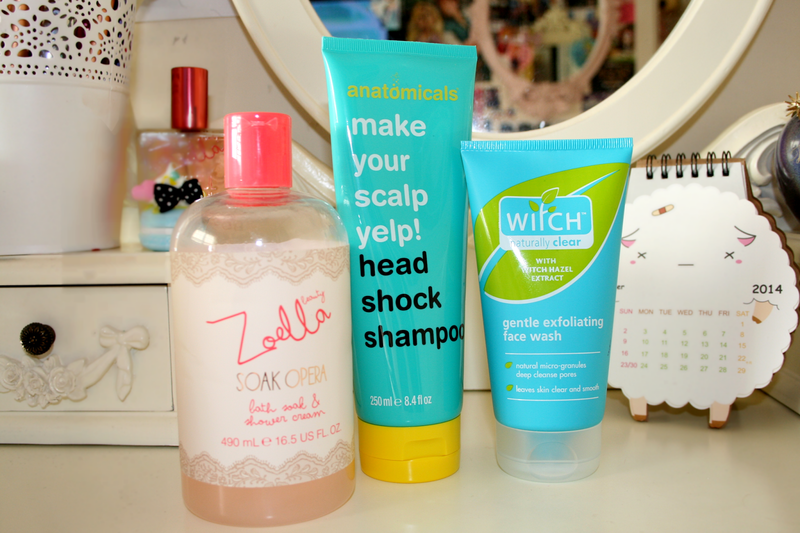 Anatomicals Make Your Scalp Yelp Shampoo: I have fallen in love with this brand for their quirky packaging, hilarious names and amazing products. When it gets into the colder months my scalp starts feeling tight and sometimes itchy. This shampoo is amazing oh my goodness my scalp wasn't yelping it was practically screaming after using this. Your scalp literally feels like it's breathing and after washing it your scalp feels cold for at least 20 minutes after. The product is amazing though as it gets rid of any discomfort that you may be having. I am literally going to buy every single bottle of this so if you want to try it out I'd recommend getting one while you can! Obviously I'm joking but I am definitely ordering about another 5 bottles of this. Witch Gentle Exfoliating Face Wash: I'm not going to lie I've always been very lazy when it comes to my skin but I am trying to look after it gradually building up a skincare routine. I picked this up after being really impressed by the Blemish Stick they have and thought I'd give this a try. This is a gentle exfoliator so it doesn't have as many gritty bits a normal exfoliator would have however if you're like me and have sensitive skin this is perfect for you. It helps remove dryness, blackheads and fights off any oiliness in your skin if you suffer from it. It's basically magic in a bottle! After using this once my makeup even looked so much better on my skin. Definitely worth picking it up to give it a try. Have you tried any of the above products, what have you been loving recently? I haven't tried any of these products but I really want to try that shampoo. I've not tried any of these products, and haven't even heard of the shampoo! All sound great. Love the sound of soap opera!